← So you want to restore a 1959 Impala Convertible? 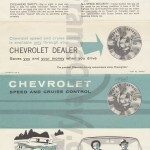 This rare brochure advertises the new Speed and Cruise Control accessory that was available for dealer installation on all 1959 and 1960 Chevrolet full size passenger cars. It was introduced in 1960, but was compatible with 1959 models also. The somewhat vague styling of the 1960 Impala shown is intriguing. A very similar brochure that illustrates a ’61 Impala appears to have been illustrated first, then modified to look like a ’60. 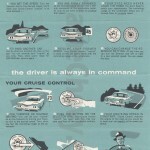 Perhaps the Cruise Control was introduced very late in the 1960 model year, after the ’61 was already in the works.